The strongest and largest joint in the human body, the knee allows the leg to bend and straighten, while at the same time carrying almost all of the weight of an individual when they are standing, walking or running. The knee is a hinge-joint that also has the capacity for lateral (side-to-side) motion. The knee joint joins the thigh with the leg at two locations – between the femur (thigh bone) and tibia (calf bone), and between the femur (thigh bone) and patella (knee cap). Because it is an active, heavily used weight-bearing joint, many people have had some type of knee problem at one time or another. Knee pain may be acute or chronic, and may be come from everyday wear and tear, overuse or injury. Most often these problems arise during sports and recreational activities, job-related tasks, or home projects. The pain can radiate from tendons, ligaments, bones, cartilage or any other structure within the complex of the knee. The patella (kneecap) is roughly triangular in shape and helps provide strength, stability and support within the knee joint. Pain may develop in the patella as a result of overuse or injury. Common injuries include dislocation and fracture, typically caused by a direct force to the knee or from abnormal twisting, bending the knee, or falling on the knee. Associated with extremely intense pain and swelling, patella dislocation often affects young female athletes aged 13-18 and occurs when the patella slides sideways out of its position on the knee. Patella fractures can involve a single crack or break across the kneecap and usually cause severe pain and swelling. A tear in the anterior cruciate ligament (ACL) is one of the most common injuries to the knee. The ACL, along with the other ligaments in the knee, connects the femur (thigh bone) to the tibia (calf bone) and helps support the knee joint. This injury occurs most often in athletes and is typically caused by sudden deceleration (slowing down or stopping), pivoting in place, or from hyperextension. As a result, the joint becomes unstable and patients experience symptoms of pain, swelling, tenderness, a feeling of insecurity or the knee giving way, and limited motion. Patients do not typically undergo ACL reconstruction surgery until several weeks after the injury, once swelling and inflammation have been reduced. In this procedure, the torn ligament is completely removed and substituted with a “replacement” ACL. This is done by grafting a tendon or ligament from another part of the body (the knee or hamstring). As ligaments will not repair on their own, simply reconnecting the torn ends of the ACL is not a fix. Arthroscopy is a minimally invasive procedure, offering patients many benefits over traditional surgery. By giving doctors a clear view of the inside of the knee, arthroscopy procedure is useful for confirming the diagnosis of various imaging procedures, x-rays and MRIs for instance, as it provides your doctor with a three-dimensional, real time look at the injured area. 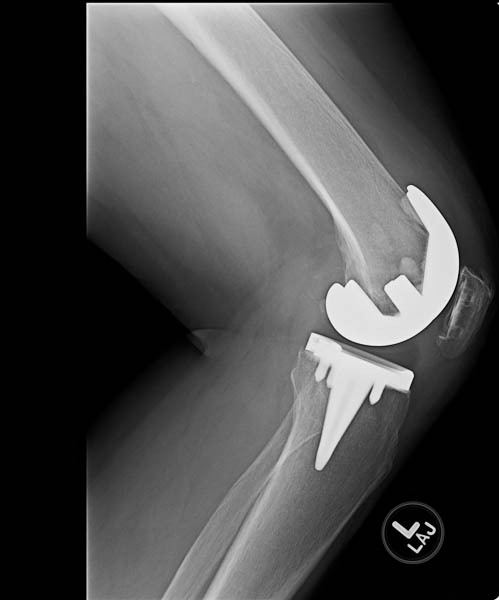 Knee arthroscopy offers patients many advantages over traditional surgery. The fiber-optic camera and surgical instruments are inserted into the body through several small, carefully placed incisions at the knee, so the procedure is minimally invasive, effectively decreases the amount of bleeding during surgery, has reduced risk of infection or other complications, and minimizes scarring. Some knee conditions that can often be treated using arthroscopy include meniscal tears, ACL or PCL tears, synovitis, patellar misalignment, arthritis and more. When undergoing arthroscopy procedure, your surgeon will make a small incision near the affected area of the knee joint and insert an arthroscope – a long, flexible tube with a fiber-optic camera at its tip – into the joint. The camera displays a video feed of what is seen on a screen, and your surgeon is able to use this internal view while repairing any damage that is found. 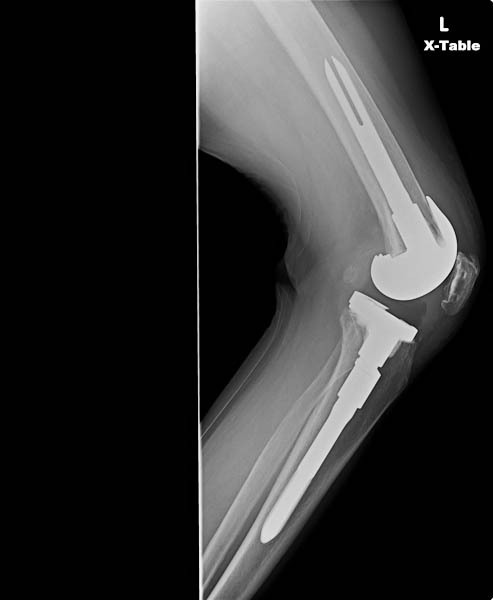 Surgery may be required for more severe patella fractures. In order to effectively restore proper function to the injured site, an internal fixation device such as pins, rods, screws or plates are used to hold the broken bone together as it heals. In smaller fractures, part of the bone may even be permanently removed. During the healing process, the knee must be kept straight, with the use of a cast or brace, and patients will often undergo physical therapy to help the process of restoring movement to the joint. 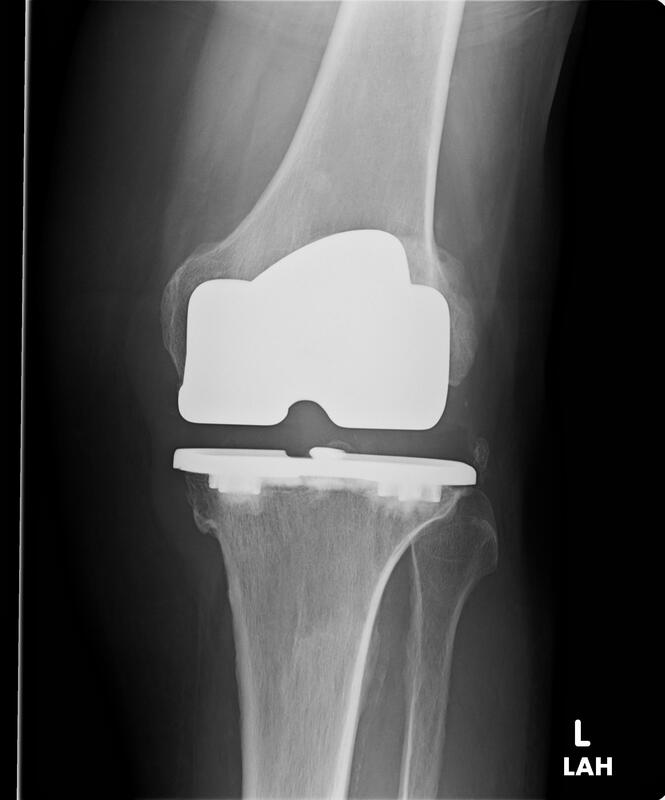 A total knee replacement surgery is performed only when a patient with arthritis or other debilitating knee injuries or diseases does not respond effectively conservative treatments (anti-inflammatory medications or cortisone injections). A knee replacement procedure is done by removing all of the bone and cartilage of the joint and replacing it with a prosthetic device. 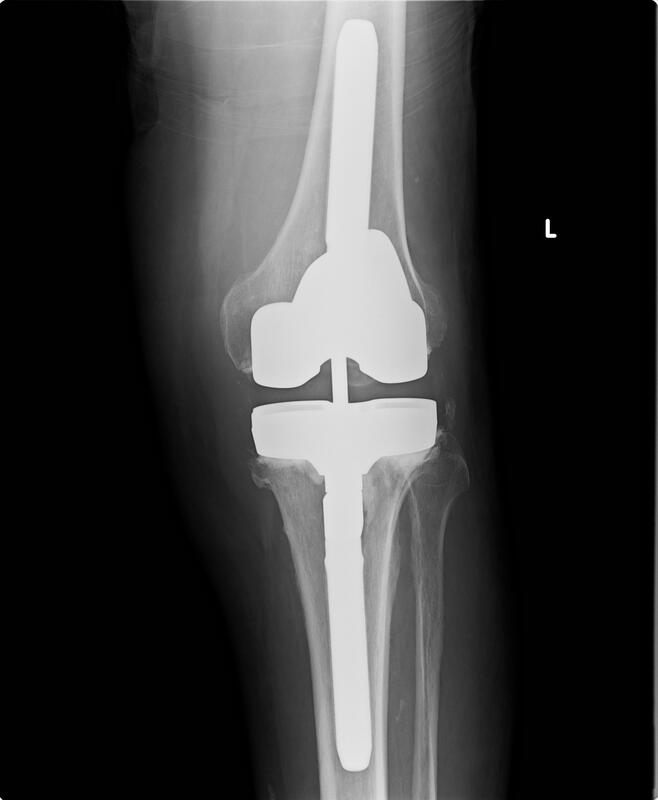 In a total knee replacement, the damaged areas of the bottom of the femur (thigh bone) and the top of the tibia (calf bone) are removed and replaced with metal and polyethylene components that replicate the natural shape of the joint. Although this procedure can take anywhere from two to three hours to perform, patients usually find immediate pain relief and are able to quickly return to regular activities. The replacement devices are designed to relieve pain caused by cartilage damage, and usually last up to 20 years in most patients.